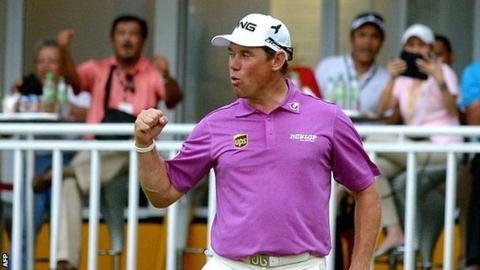 Lee Westwood captured the 41st title of his career and the 13th in Asia after overcoming a four-hour weather delay to win the Malaysian Open by seven shots. Only one ahead going into the final day, Westwood made two birdies and was four shots clear after 11 holes when the threat of lightning suspended play. After the resumption, Westwood added two more birdies to complete a round of 68 and an 18-under-par total. Former Open champion Louis Oosthuizen also shot a 68 and shared second place. Danny Willett had been in sole possession of second after five birdies in his final round but ran up a double-bogey seven at the last to tie for fifth. Another Englishman, Andy Sullivan, began the day second after a 66 in round three - but carded a triple-bogey seven after going in the water at the second hole. Despite three successive birdies, Sullivan found water twice more on the back nine to finish with a 78 and a share of 13th. It was Westwood's first tournament win since the 2012 Nordea Masters in Sweden. The 40-year-old finished in style at the Kuala Lumpur Golf and Country Club with a birdie at the last from 15 feet. Westwood, seventh at last week's Masters, credited the recent changes he had made to his game for the revival. "I started working with a new coach a few weeks ago, Mike Walker, and Billy Foster came back on the bag at the end of last year, so I was going back to what I had done before because it had worked," said the world number 36. "It's started to work already - the last couple of weeks I've played well in Houston and at the Masters last week and this week I've obviously played very well. "It's a golf course that suits my game; it's very tight in certain areas. I played well, I putted well, and the short game is good."